The Wikitherapist project aims to empower health researchers/practitioners with robot assistants or mediators in behavioral therapies for children with autism. It combines end-user programming and learning by demonstration for easy creation of behaviors on a robotic platform that can be used for therapy of autistic children. Within the project interactive scenarios between the robot and the autistic children are developed with the help of therapists and psychologists from Dr. LeoKannerhuis and ARC Cambridge. 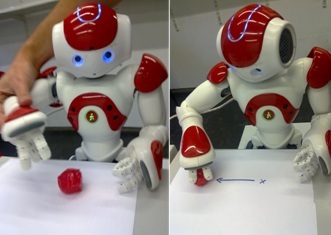 A humanoid robot NAO is used as working platform which is enhanced with GPU based robot command language that enables real-time processes to run in parallel. The end-user programming environment is supplied by the company TiViPE. The goal of the project is to create a web based community of therapists and robot practitioners who co-create robot behaviors and scenarios with different complexity. The expected result is an easy to control by non-specialists robotic environment which is equipped with library of behaviors and scenarios that are found useful for behavioral training of people with autism. The tools can be used also in general context.